There are many different advantages that a lease can offer for a new car buyer, including lower payments, flexibility, and the ability to keep your car under warranty the entire time. This section of the leasing guide will go through all the different advantages that a lease offers compared to buying or financing a car. It is for these reasons that leasing is becoming a more and more popular way for todays consumer to get into a new ride. Have a quick look, and then each is explained further in-depth later on in this section. Low Monthly Payments - Most of the time, a lease will cost you far less every month than financing the same or similar car would. 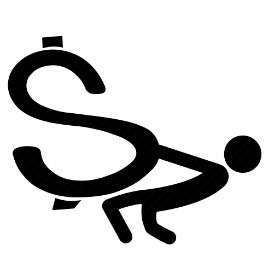 Flexible Down Payments - Many leases can be signed with little or no money down. If you do choose to put money down, it will reduce your payment by a lot more than if you were financing. New Technology - A lease allows you to easily upgrade your car every few years, allowing you to keep up with the latest trends in car technology, from safety and performance to entertainment and communication. Short Commitment - Lease terms are a lot shorter than bank loan terms, giving you more flexibility to accommodate lifestyle or professional changes in your life. New Car Warranty - In most cases, the car you are leasing will be under warranty for most or all of the lease period, providing extra safety and peace of mind. Tax Benefits - If your car is used for business, or leased through your company, you could write off a portion of your leasing costs on your taxes, saving you some extra money. Options at Lease End - At the end of the lease, you can choose to purchase the car, exchange it for another lease or purchase, or just walk away and do something else. This is one of the most popular reasons why so many buyers opt for leases on their new vehicles. Depending on the type of car that you are purchasing, a lease can save you an average of anywhere from $65 to $206 per month compared to financing. 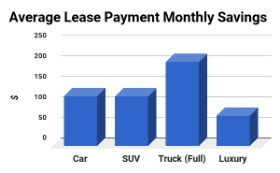 Those are average values for different auto segments, so the actual savings that a particular lease can offer can be even higher. The low monthly cost of a lease makes it particularly attractive to a wide variety of car buyers. Drivers who unexpectedly find themselves needing an additional or a replacement vehicle will appreciate the lower impact that a lease has on their monthly budget. Likewise, a low-cost lease can be a good choice for a first car or for buyers on a fixed income, such as retirees. 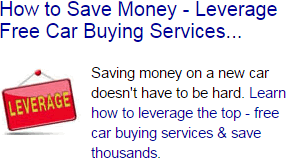 The low payments on a lease also make it easier to justify purchasing a more expensive car or a higher trim level. Because you are ultimately only paying for a portion of the total price of the upgraded features, getting all of the features that you want in a car may only increase your monthly payment by a small amount. Compared to financing a new vehicle, a lease can provide a lot more flexibility when it comes to the money you need to pay up front to get the car you want. Unless you have a nearly pristine credit score, it can be very difficult to finance a car with a small or no down payment. Most banks usually require a down payment of around 10% of the overall cost for financing. By comparison, many manufacturers and dealerships offer leases with no down payments beyond the initial fees, with some even rolling those into the monthly payments for no initial payment at all. If you need a new car on short notice, such as a result of losing your previous car to accidents or malfunctions, having to move to a new area for work, or a growing family, leasing can offer a good way to get a new car without having to wait to save up for a sizable down payment. As a converse to this, a sizable down payment will also reduce your lease payment more significantly than it would a finance payment. The capitalized amount - the money that you borrow and make payments on - is much smaller in a lease than a finance and repaid over a shorter term, so the same down payment will lower your monthly costs by a lot more in a lease than in a finance. In a typical lease on an entry-level car, an extra $1,000 down payment will reduce the monthly payment by roughly $30, while a typical finance on the same kind of car will require between $2,000 and $3,000 down payment increase to achieve the same effect. Whether you are looking to put down a lot of money on your new car or as little as possible, a lease can offer you much more flexible options than a similar finance would. Depending on what your financial plans are when it comes to purchasing a new vehicle, a lease could make it easier to accomplish your goals. If you are the kind of person that likes to trade up to a new car every few years, then a lease is the perfect way to do so. Most leases last from two to four years, set at the start of the lease, which means that the new model is often coming out right as your previous lease comes to an end. The fixed residual value means that you do not have to worry about the market price of your car, have to haggle over its trade-in value, or worry about making sure that you have positive equity in your vehicle - owing less in payments than its market value - when it comes time to trade up. The ability to regularly get a new car synergizes nicely with the low payments that a lease offers, especially on premium or well-equipped vehicles. That is perfect for drivers who need the latest infotainment or safety technology, or want to take advantage of engine improvements that make their favorite car faster or more fuel-efficient. As new technologies usually are first released on higher trim levels or pricy optional packages, a lease can significantly reduce the monthly cost of being an early adopter. A lease can be a very flexible way to purchase a car when you know that you will only need for a few years or will need to change out for a different one. Over the last decade, the average financing term has gone up to 69 months and having a new car loan that lasts for 6 or 7 years is becoming increasingly more common. These arrangements can make it more difficult to trade out of your car for a different one, while a lease easily lets you switch several times during the same period. If you are the kind of person that likes to try and drive many different cars, it is easy to move from one manufacturer or brand to another, or even radically switch up vehicle types when leasing. 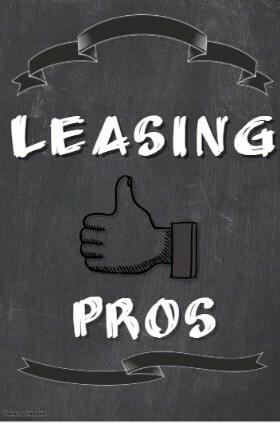 Leases typically last from two to four years, with a three-year lease being the most common. For drivers who see themselves looking for something different to drive after a couple of years, the short commitment period of a lease is perfect. The fact that a lease only lasts a few years and allows you to painlessly walk away from the car at the end of the term is also good for buyers who are anticipating significant lifestyle changes in the near future. If you are planning to start a family or are expecting that you will need to move to a snowy area for work in the next couple of years, a lease can give you the flexibility to drive the kind of car that makes sense for you at the present while letting you switch to the minivan or all-wheel drive SUV when the time comes. If your life is filled with changes, by circumstance or choice, then the flexibility that a lease offers is a strong advantage. With a commitment of only a few years compared to the five to seven years that most finance deals offer, you are in a much better position to have your car adapt to your lifestyle. 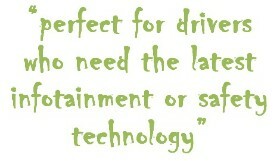 While always driving a new car is nice, it also comes with a number of practical benefits. With a car that is fresh from the factory, you are less likely to need costly repairs or tuneups, and any serious issues that arise with the car will be covered by the new car warranty. It is not a coincidence that the most common lease term is the same as the standard new car warranty - 36 months. When leasing a car, you will be covered by the warranty throughout most of, if not the entire leasing period. 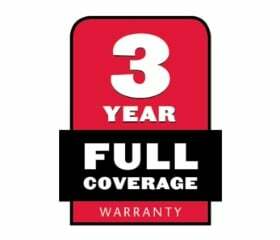 In addition to the fact that any defects or issues will most likely be covered under the warranty, you also get an additional peace of mind from not having to worry about your car’s condition. You just need to take it in for its regular oil changes and a tire rotation or two, and expect it to continue running well throughout the leasing period. Additionally, many manufacturers include a number of services for the duration of the warranty period, ranging from roadside assistance to in-car Wi-Fi. Leasing lets you take advantage of those special offers for your entire car ownership experience. While this is a fairly niche benefit of leasing a car, a lease can offer some tax benefits compared to financing the car if you are using it for business purposes or registering it to your company. If you find yourself in that position, then you should definitely consult your accountant or legal expert to see how much tax benefits a lease can provide you or your business compared to financing or purchasing the same vehicle. In addition to offering more flexibility thanks to its short term of commitment, a lease also offers several different options to choose from once it is over. In addition to simply returning the car to the leasing company, you also have the option to purchase the car or trade-it in for another purchase or lease when the lease is over. While the residual value of the car you are leasing is set at the start of the lease, the actual market value of your car can end up different when the lease is finally up. If the car is worth more as a trade-in than its residual value, then you can leverage that difference towards a better lease or purchase deal on your next car. The details behind this will be covered later in this guide in the section dedicated to the options you have available to you during the lease and at lease end. In addition to using the positive equity of your lease to get a better deal on a new car, it is also possible to purchase your leased vehicle the same way you would any other pre-owned car. In addition to serving as the predetermined end value for the car, the residual value set at the start of the lease is also the pre-negotiated price at which you can buy out the vehicle at the end of the lease. Depending on how aggressive the initial lease deal was, you may have the option to purchase a car at a much lower price than a similar pre-owned car would cost. And even if the residual value ends up being fairly close to the market price of the car, you can still buy out your lease if you find it to be perfect for your life going forward or simply have fallen in love with the car. While it is not a particularly popular option for most lessees, it does add an extra bit of flexibility to the already flexible leasing contract.